Looking for an Innovative fixed solution for missing teeth? Dental implants are on the forefront of dental advancement and are a perfect option for replacing missing teeth! Conveniently located in the Normandy area of Jacksonville, FL, the office of JR Dental and Associates specializes in dental implant placement and restorations. Dr. Rondon and her staff’s goal is to make dental implants affordable for more patients. If you would like to get dental implants however the cost is keeping you from exploring the option, give us a call to learn more about the implant dentistry we offer. Dental implants are built to last. 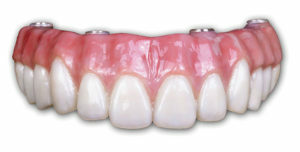 Rather than using a removable prosthesis or an affixed bridge, implants create permanent solutions. They are the next best thing to having a natural tooth. If a gap left behind by a missing tooth is not filled with something acting as a tooth root, a patients facial structure slowly changes with the deterioration of jaw bone and shifting of neighboring teeth. However, dental implants not only offer a false tooth solution but implants also acts as tooth roots as they are surgically placed in the jawbone. The jaw bone then heals around the implant (the implant integrates into the jawbone) and minimal, if any bone loss or weakness will occur. 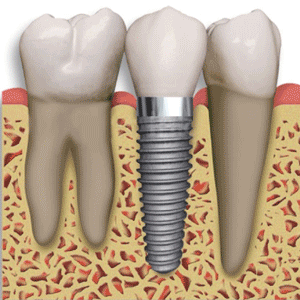 For these reasons, dental implants are now the gold standard of replacement tooth therapy. Why is guided Implant surgery best? Our computer software takes into consideration the exact dimensions of your teeth and mouth and formulates a plan that dictates the best, most precise way to surgically place the dental implants. The program expertly considers the patients current bite position and strength, aesthetics, and the optimal bite position for chewing performance and restoration longevity. Patients who receive guided surgical treatment for dental implants typically experience quicker healing and a less invasive experience than those receiving non-guided implant surgeries. Additional benefits of dental implants are that they provide a ‘no worries’ feeling while speaking or eating in comparison with alternative treatment methods such as dentures or bridges. Implants allow patients to eat nearly anything including steaks or corn on the cob. If patients take care of their implants as they should with their natural teeth, they often last a lifetime. Solid Zirconia full-arch implant prosthesis offers a fixed implant solution for patient missing all teeth and desiring a full mouth reconstruction with a more durable and aesthetic solution than any removable dentures. Patients looking for a second opinion find that our office offers more for less. Our affordable dental implants are a perfect solution to improve your bite without affecting adjacent teeth. A treatment plan that coordinates the placement of implants with future restorative needs works best to limit additional dental work. JR Dental and Associates treat the patient’s whole mouth not just the immediate need. Our in-house technology and lab ensures fewer complications that arise when having to send out to off-site labs. We know the key for low prices is to reduce costs whenever possible, that is why we maximize in house options whenever possible. We combine the latest technology to fabricate quality products at affordable prices. We are able to pass the savings onto our patients due to owning technologically advanced equipment. We eliminate expensive third parties like imaging centers, lab technicians, and other facilities. We take our own CT scan that helps to plan for precise, less invasive surgery. We do our own temporaries needed during the healing process and most importantly, we fabricate our own final crowns. We will get the maximum benefit from medical and dental insurances. We offer financial plans with minimal to no interest using third party financing like Care Credit and Springs tone. If you prefer to pay in full, you can be eligible for a discount. Whether you live in or are located near the Normandy area of Jacksonville, you can ask any dental implant question to JR Dental and Associates and expect honest answers. Our office is dedicated to creating patient relationships and healthy smiles that last. 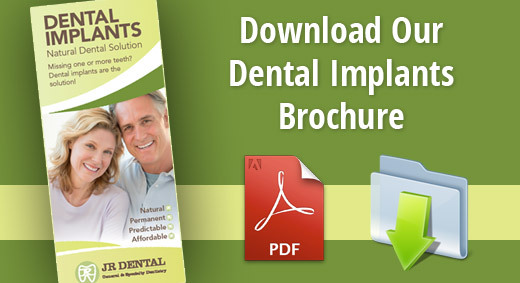 Expect quality and call today to find out if dental implants in Jacksonville are right for you.